I received a call several weeks ago from a gal at Fairview General Hospital who leads a coalition of people at the hospital in recycling, and efforts to be green. She had visited my booth at Tremont Art and Culture Festival and was quite interested in the REblooming Bags. 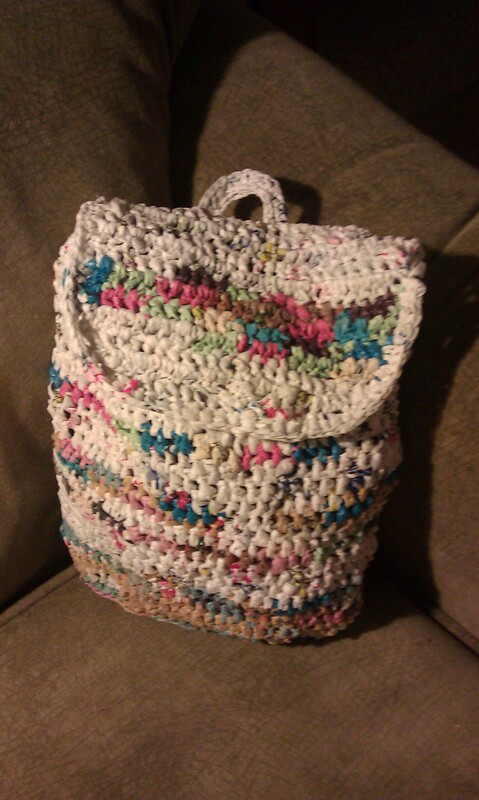 So, November 15th is a special event at the hospital, and she had asked me to provide a bag for her raffle. Here it is world – a plarn backpack. I took the picture before sewing on a big blue button. I had planned to give a market bag, but realized i have sold them all….. so it is time for that crochet hook to get flying to restock the supply. If you are at Fairview General Hospital on the 15th, be sure to find your way to the activity area, and buy a raffle ticket to win this bag. Measurements are 8.5″ wide, 4″ deep and 11.5″ tall.